Activity: Visit to Segovia and Pedraza. Services: Coaches + Guide + Tickets monuments + Tapa. Departure: Wednesday, Friday and Sunday. Time: 09:15 am. Start Location:JULIÀ TRAVEL OFFICE: San Nicolás 15 (Next to Plaza de Ramales. Conditions: Book at least 24 h. advance. Cancellation fee: 100% for less than 72 hours notice or no-shows. Languages​​: Spanish, English. Lunch is not included. However you can choose any of the options listed below, referring to the required supplement on the price fact sheet. Tourist Lunch: La Granja White beans; Segovia style stuffed veal with garnish and Dessert (Drinks not included). Gastronomic Lunch: La Granja White beans; roasted suckling pig; Punch cake with ice cream and Red wine of the house, mineral water and coffee. 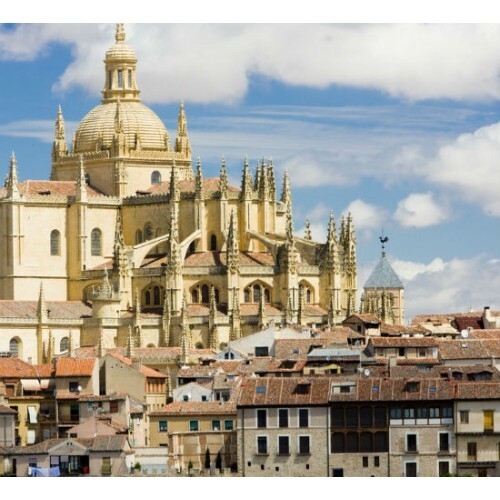 The first stop in our tour will be in the medieval town of PEDRAZA, located in the province of Segovia, 37 km northeast of Segovia capital and an hour away from Madrid. This beautiful walled town offers plenty of attractions that give it a unique rustic historical aspect. This characteristics led to it being declared a Monumental Area in 1951. Walking through its cobbled streets and emblazoned buildings, we transport ourselves to medieval times. We will enjoy a glass of local wine and tapas in a typical inn next to Pedraza’s main square before leaving the charming town. 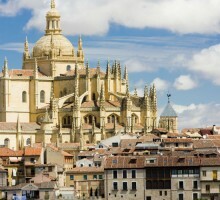 Afterwards we will go to Segovia, famous for its well-preserved roman aqueduct (16 km long). Home of the crown of Castile, this city preserves one of the most important medieval sites in Spain. Due to its elegance, the Cathedral is considered to be “the Lady of the Cathedrals”, and the Alcázar is the most spectacular castle in the country. Entrance fee to Cathedral and Alcazar. A glass of wine with Tapa.